A commonplace amongst expats in the Netherlands is that Dutch food is neither particularly diverse nor especially good. This is partly a misconception engrained in old prejudices that have largely lost validity. On one hand, over the past decades the food industry in the country has exponentially grown in both quantity and quality: the 2018 calendar, for example, has over one hundred Dutch restaurants listed with one or more stars in the Michelin Guide. On the other hand, Dutch food no longer consists uniquely of bread, cheese and Stamppots. Today, Dutch cuisine is an accepted citizen of the world as much as global cuisine has found a naturalized home in The Netherlands. The food festival is one of the concrete materializations of this new Dutch approach to food. Combining the Dutch love for festivals and big social gatherings with a wave of hip, instragrammable young food trends, the food festival format has rapidly gained momentum and reach over the past few years, with no sign of slowing down in the future. These festivals often combine their variety of foods with live concerts and performing arts. Food in this context is not only a culinary experience, but also a social and cultural one, defined by its atmosphere and context as well as by its contents. From an artistic perspective, if restaurants are parallel to museums, food festivals are so to street art, and their beauty lies in the ephemeral contact with good food and moments in a transitory landscape. This is The Holland Times short selection of Dutch Food Festivals in 2018. Food trucks are the main symbol of food trends leaving restaurants and taking the streets. Trek and Rrrolend are two of the biggest in The Netherlands, hitting the most important cities during the year with dozens of trucks camping on parks and public areas of Rotterdam, Amsterdam, Utrecht, Leiden, Den Haag and many others. The treat of food trucks is the variety of food (going from burgers and vegan options to sushi and insect-based dishes) accompanied by a range of entertainment (music bands, children activities, theater) in a set of changing landscapes. What’s special about De Parade is that it’s not much a food festival with entertainment as a theater festival with food. Here, around 60 performances (most of them made especially for the festival) are presented in a city’s public place in the summer, each of them lasting for about 30 minutes so several can be seen in one night, with an assorted selection of food options to eat in between. Having successfully run for a decade now, National Restaurant week brings once again haute cuisine to the food fest scenario. This is how it works: for one week during the spring, highend restaurants throughout the country, including Michelin Star owners and hip and trendy newcomers, lower their prices (starting from around €27 for a 3-course dinner) so their food becomes affordable for a bigger portion of the public. This has proved a successful strategy to democratize high-end cuisine for the greater audience. As restaurants tend to be fully booked, one piece of advice: reserve as early as possibly (reservations are available one month in anticipation). Amsterdam Amsterdam’s very own mobile food festival brings dozens of restaurants out in the open, in the Westergasfabriek, to inaugurate the amsterdammer- summer as a huge open restaurant with free entrance. Under the sun or under the stars, the public can enjoy during four days a mixture of food, drinks, music, theater and cinema. www.rollendekeukens.amsterdam.nl 09/05—13/05 / Westergasfabriek, Amsterdam Culinesse Set on the beach of the Zevenhuizerplas lake between Rotterdam and Gouda, Culinesse provides and ideal location for a summer musical and culinary mashup, with more than 10 participating restaurants and a group of interesting artists, featuring in the 2018 edition BLØF, Kensignton, Milow, Candy Dulfer, Danny Vera and Golden Earring, among others. 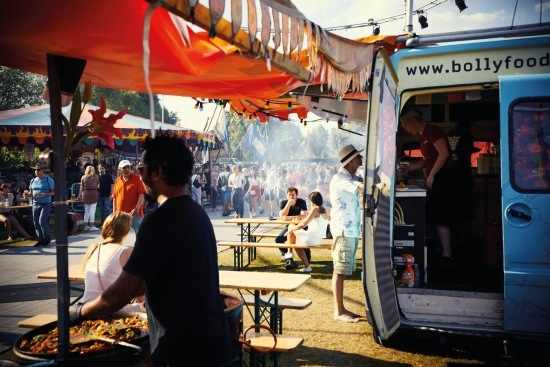 Not a food truck festival, but a restaurant festival that comes to the Amstelpark in the summer with established names and chefs, wine tastings, masterclasses and cooking shows, besides some of the best restaurant food in the capital. This year’s 10th anniversary promises to be a culinary mecca to attend in 2018. Because not all food festivals must by force happen during the spring or summer, Vissch is a perfect exponent of the mysterious Northern Sea Dutch Fish culture in the middle of the autumn season. Held on the Visafslag of Scheveningen, this modest, young festival is growing year by year with the enchantment of its genuine local aura, fresh food, music and fish auctions.